Well, I have been remiss and failed to keep up with the 30 days of blog since last Tuesday. I have totally bombed the final week of 30 Days of Blog. Every day just seemed to be too much for me this year so I’ll have to see if I can do better next year. I do have to say, however, as a working mother of two, 19 posts in 30 days is pretty good, and I believe it is more than I have ever done in a month. I’ve gotten more crocheting done in the last month than I probably have in the last year. I certainly do need to make more time for myself to crochet. I can’t normally do it every day, but at least a few times a week should be possible. I think I’ve proven that to myself this month at least. I have gotten behind in keeping up with the dishes, (including the darn baby bottles and pump parts) and the laundry in order to do my posts this month. There have been a few times I was pulling diaper liners out of the dryer to stuff so that I could put them on a kid. But the traffic on my site has increased dramatically and I think a short-term intense campaign has been worth it. Now I just have to find the balance I need to keep up with both. One or two posts a week should do the trick. I had hoped to get caught up on the Granny Square Project and didn’t get that done. But I am a lot closer to being on track than I was at the beginning of the month. 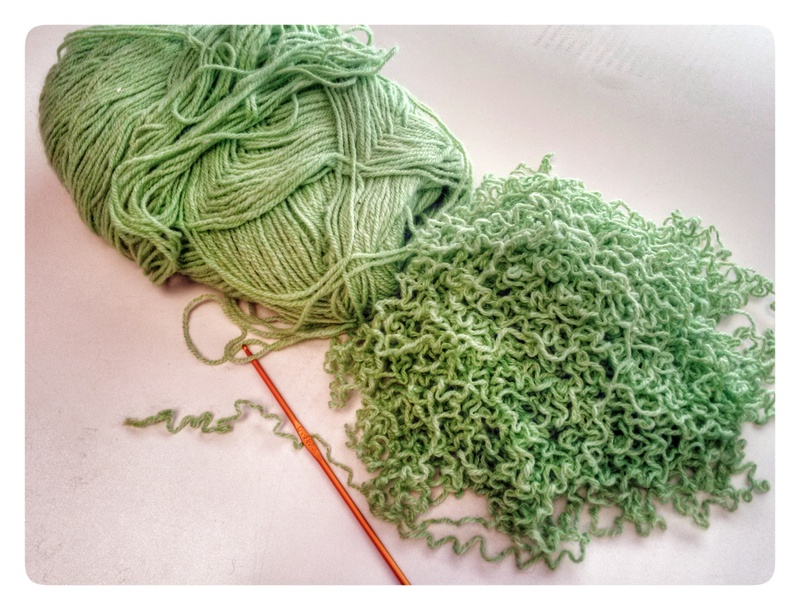 This green yarn will be May’s second square. It’s actually a skein from my Grandma Townsend’s old stash that my Dad had given to me and I had previously started another project with. 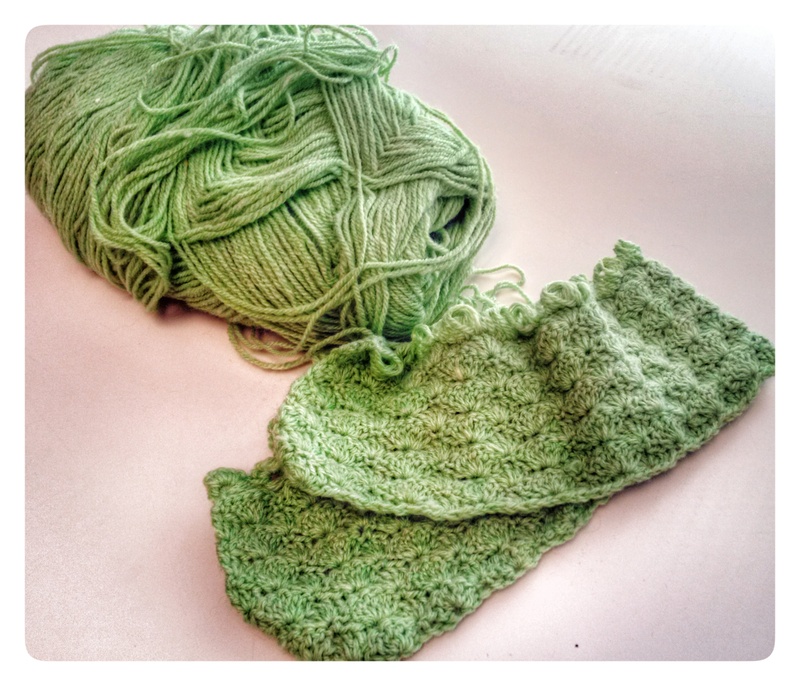 I honestly don’t even remember what it was going to be – maybe a Prayer Shawl. But didn’t like where it was going so it ended up in a bag with my yarn stash. I frogged it this morning and now have this nice pile ready to start Square Ten. Thanks so much to my friend for inviting me to join the insanity for this year’s 30 Days of Blog. It has been great for me. See you next year! 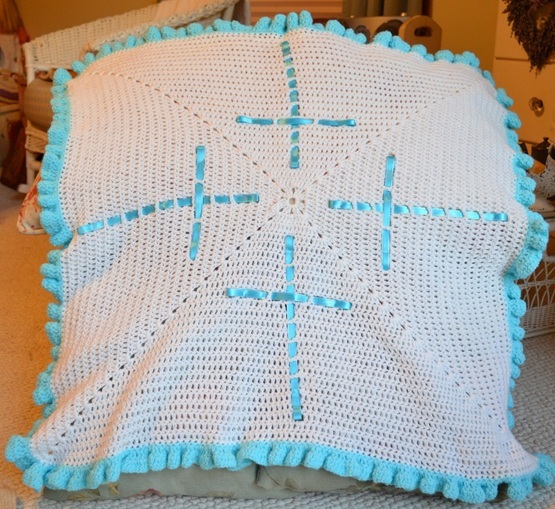 I’ve mentioned previously that I’d submitted the pattern for the afghan I made for Greyson’s Baby Blessing for publication. It was not accepted and I’ve been meaning to get the pattern uploaded to sell on Ravelry myself like I did for Persephone’s Ribbon and Pearls afghan. Somehow I just haven’t gotten that done and now I’m glad. My design goes perfectly with what they’re looking for both with its simplicity and coincidentally with the blue ribbon. I’ve submitted the design and I’m anxious to find out if they’ll use it. If you haven’t noticed, I have been using yarn from my stash to make each of my squares and not buying any new. As a result, I’ve been using different yarn types together where I normally never would. The most common example of this has been using worsted weight Red Heart yarn with the lighter Caron Simply Soft. But this is more of a sampler piece, so that rule is temporarily suspended. Because the weights and textures are different, I often have to change the size of the crochet hook I’m using in order to maintain the same gauge after changing yarns. 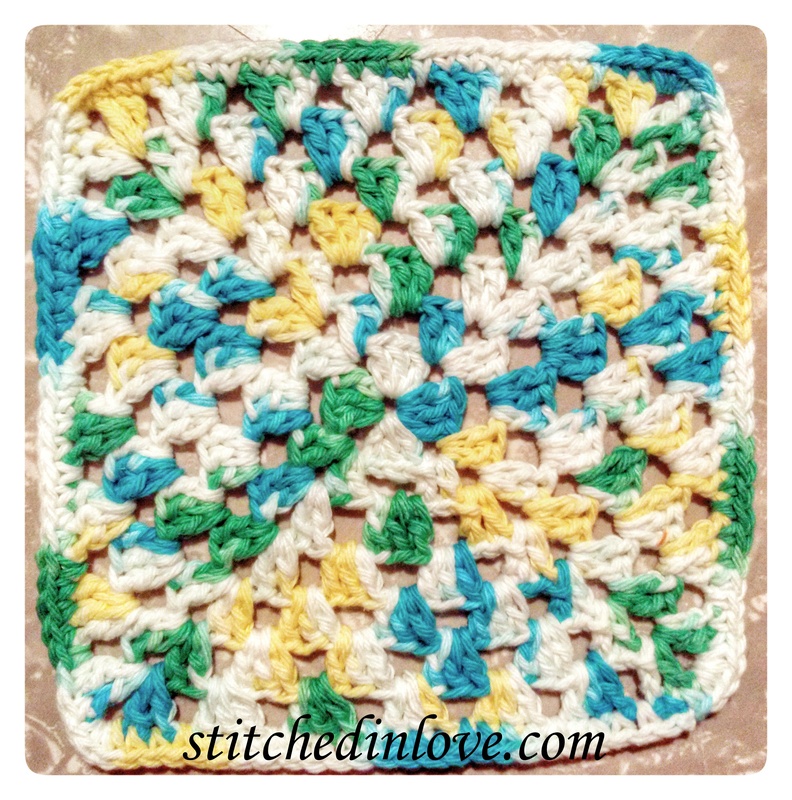 May’s first square is another extremely simple Granny, however I found a lovely variegated cotton yarn in my stash that I used to make my family dish cloths for Christmas a few years back. The color just said “May” to me and the cotton texture will definitely stand out in the finished afghan. April’s second square is blessedly more simple than the daffodil debacle. Yellow isn’t normally my color. Maybe I’m just not the bright and cheery personality that it implies, but it’s normally not the first color I would select. 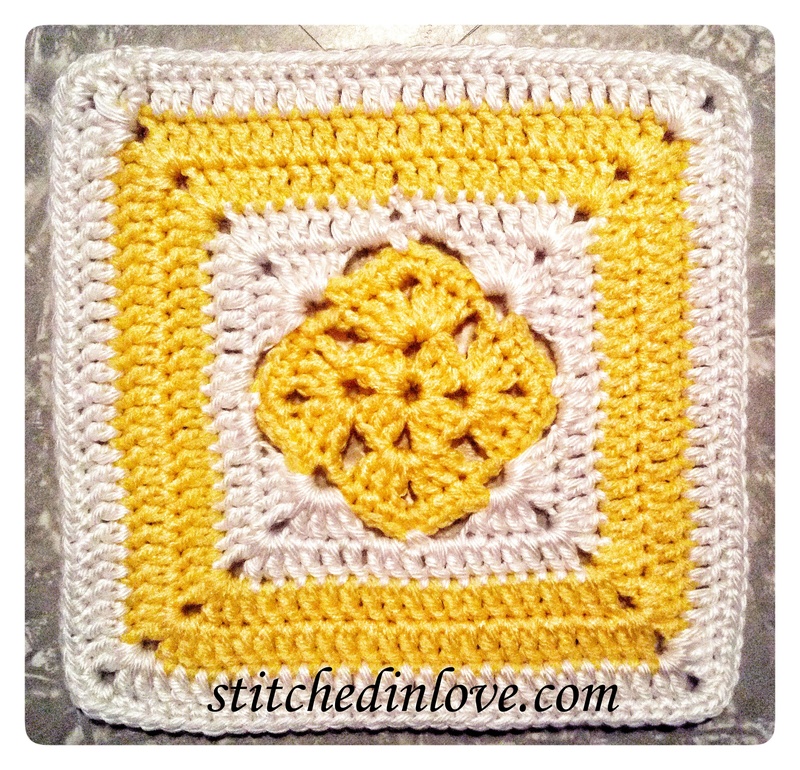 But I figured an April square for spring time would be yellow. And I was surprised to find myself refreshed by this little gem. The square is a little more than basic with an offset diamond in the center which requires a bit of shaping, and two chain-2 spaces at the center of each side to mix things up a little bit. The original inspiration for the square can be found here but I’ve modified it and written my own pattern again. My pattern can be found on Ravelry, here. Additionally, I have added an optional replacement to round 5 to close the chain-2 spaces on each side and make solid rows instead. I think I like the open spaces however. I have also added this to my Ravelry store as a downloadable PDF. Download here! Round 1: With Color A, sl st in a magic ring, ch 3, 2 dc in ring, ch 2, (3 dc, ch 2 in ring) 3 times, join with sl st in top ch of beg ch 3, pull tail of magic ring tight to close ring to complete round. Round 2: Sl st across to corner ch 2 sp, (ch 3 (counts as beg dc), (2 dc, ch 2, 3 dc in same space) ch 2 [3 dc, ch 2, 3 dc in next ch 2 sp, ch 2] 3 times, join with sl st in top of beg ch 3. Round 3: Ch 1, sc in same st, and next 2 dc, [3 sc in corner ch-3 sp, sc in each of next 3 dc, ch 2, skip next ch-2 sp, sc in each of next 3 dc] 3 times, 3 sc in corner ch-2 sp, sc in each of next 3 dc, ch 2, join with sl st in beg sc. Finish off. Round 4: Join Color B with sc in the second sc of any corner, ch 2, (4 dc, ch 2, 4 dc) in next ch-2 sp, ch 2 (this will be the new corner); [sc in the second sc of the next corner, ch 2, (4 dc, ch 2, 4 dc) in the next ch-2 sp, ch 2] 3 times, join with sl st in beg sc. Round 5: Ch 4 (beg dc plus ch-2), skip next ch-2 sp, dc in next dc and in each across to corner ch-2 sp, [ (2dc, ch 2, 2 d) in corner, dc in each dc across to next ch-2 sp, ch 2, skip ch-2 sp, dc in next st, ch 2, skip next ch-2 sp, dc in next dc and in each across to corner ch-2 sp] repeat from [ to ] twice more, (2 dc, ch 2, 2 dc) in corner, dc in each dc across to next ch-2 sp, ch 2, join with sl st to beg dc. Finish off. Optional Round 5: Ch 2, 2 dc in next ch2 space and in each dc across to corner ch-2 sp, [ (2dc, ch 2, 2 dc) in corner, dc in each dc across to next ch-2 sp, 2 dc in ch-2 sp, dc in next st, 2 dc in next ch-2 sp, dc in next dc and in each across to corner ch-2 sp] repeat from [ to ] twice more, (2 dc, ch 2, 2 dc) in corner, dc in each dc across to next ch-2 sp, 2 dc in ch-2 sp, join with sl st to beg dc. Finish off. Continue each round going forward by double crocheting straight across each row instead of completing the chain 2 spaces. Round 7: ch 2, dc in next dc, [ (2 dc, ch 2, 2 dc) in corner, dc in each dc across to next ch-2 sp, ch 2, skip ch-2 sp, dc in next st, ch 2, skip next ch-2 sp, dc in next dc and in each across to corner ch-2 sp] 3 times (2 dc, ch 2, 2 dc) in corner, dc in each dc across to next ch-2 sp, ch 2, skip ch-2 sp, dc in next st, ch 2, skip next ch-2 sp, dc in next dc and in each across to beg dc, join with sl st to beg dc. Finish off. Repeat rounds 6 and 7 changing colors until desired size is reached. Weave all yarn ends and block your work. *Note: I only repeated round 6 once in white and then completed an edging round of single crochet to remain within the 7 inches for the squares that I am completing for the Granny Square Project. 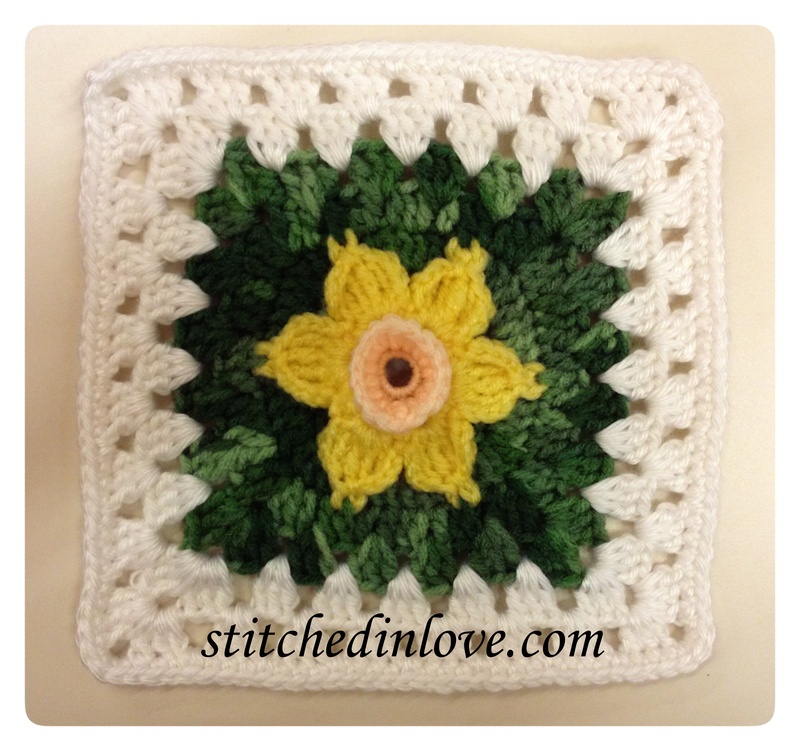 April’s first square is a daffodil. To give credit, I got the pattern here on Craftsy, for $3.99 but the pattern actually irritated me quite a bit. It was very poorly written. Many of the instructions were incomplete and unprofessional. For example, when changing colors the instructions failed to indicate to finish off. This even included the end of the pattern. This may seem obvious, but most crochet instructions indicate that you should not finish off unless instructed to do so. Some of the spacing in attaching the daffodil petals to the green were just wrong in my opinion. Also, the language used for many crochet instructions was not what is normally used in pattern instructions. “Sc into ring” is used instead of “sc in ring.” Into is just not necessary. “Arches” is used instead of ch-2 space. I did not like how the block went from circle to square by working 3 dcs in between stitches instead of having made a ch 1 space in the previous row for that purpose as is usual with granny squares. The pattern is marked as easy but I strongly disagree with that. I was able to figure it out and get it to work, however I don’t think that a beginner would have been able to pick it up and get a good result without help. For example, a picot stitch is used for the tip of the flower petals, however the pattern does not give specific stitch instructions for a picot. There are two issues with this. 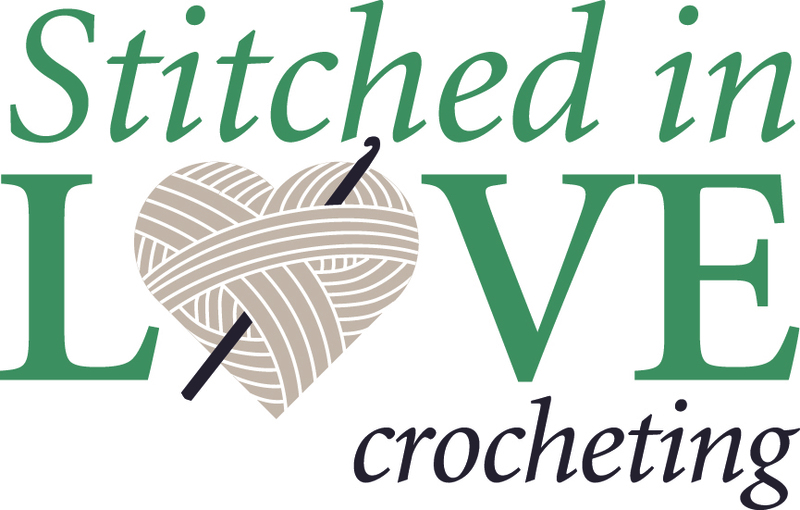 One: A picot is not a beginner stitch, it is a more advanced stitch. Two: There can be different ways of doing a picot so stitches like this should never be assumed. Additionally, 3-d work and shaping are generally not considered beginner level. I would really consider this more intermediate to advanced. Finally, the thing that irritated me the most is the trumpet of the daffodil. The instructions say to work a round of single crochet in the front loop only of round 1. This would be great except that round 2 was NOT worked only in the back loop of round 1 so it was extremely difficult to work into the front loop of round 1. All that being said, the square turned out very charming with another 3-d aspect. But I think I’ll take time tomorrow to rewrite the pattern and make these corrections mentioned and see if it turns out any better. I’m finally back on the Granny Squares. 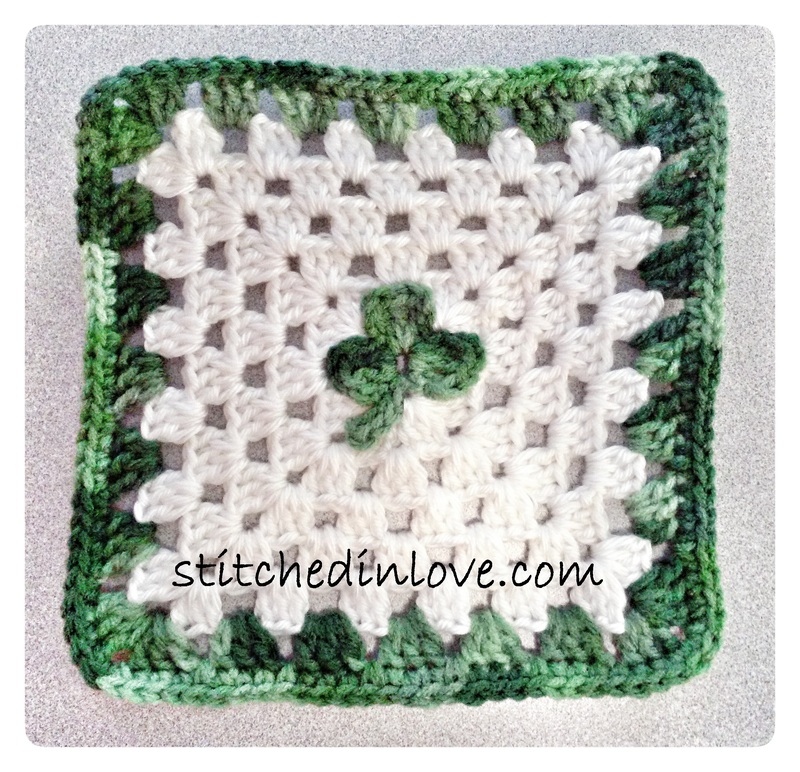 This shamrock square turned out really cute. 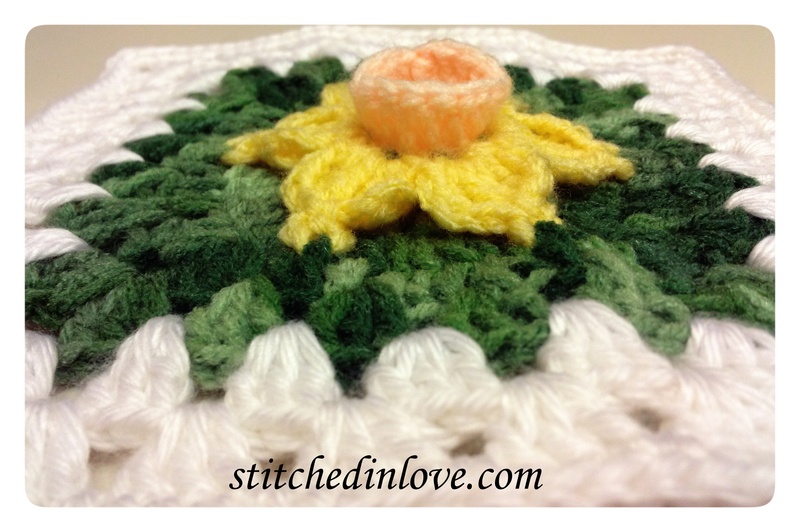 It’s hard to see in this picture, however the square is crocheted behind the shamrock giving it a 3D quality. The shamrock is worked first and I used the same shamrock as my St. Patrick’s Day Garland. The rest is worked the same as January’s Square One again, starting with round 2 joined to the back of the shamrock. It is really easier than it might seem. 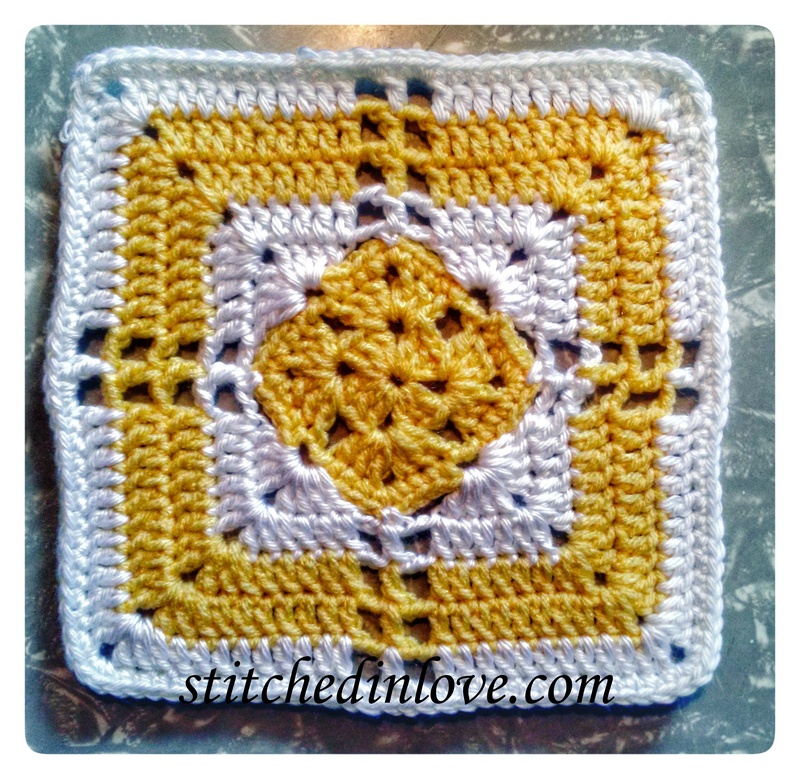 This square, as with all of them really, will look much better after I get it blocked.